I'm actually quite calm today, I'll have to find something to annoy me.. where's the Daily Wail? I am angry it's been glorious sunshine today and mr rain has to spoil it tonight. Buying from outside the EU? The threshold for when you have to pay import VAT is being reduced from £18.00 to £15.00 on the 1st of November 20011. What really annoys me is when you buy something from abroad e.g. America and you pay the postage at that end. When it arrives in the UK the Customs and Excise hold it to check the value and the Post Office then charge another £8.00 to collect and deliver it at this end. Man Utd..Wayne Rooney..Alex Ferguson...Man Utd fans... bit of a theme there. Reality TV shows..what a pile of...@@@@. And why does anyone give those losers Kerry Katona and Katie Price any air time or more to the point WATCH IT!!!! Hoping to make a start on the layout before Xmas!! That's one hell of a time away! Always happens when you alter what you've written and then don't proofread properly. So, Royal Mail charge £8.00 for filling the import form, but in their Parcelfarce guise they charge £13.50 if the package is sent by the EMS service. Is the form 1,000 extra pages or what??? The cost of food goes up every week even when the fuel drops by 2p it still goes up. If pigs could fly would the price of bacon go up? I feel sorry for my mates at home paying both ends when buying overseas, that is pretty disgraceful, here in Aussie if I buy from England we don't have to pay your VAT which pays for the postage and no extra charge when it arrives at our doorsteps a week later. 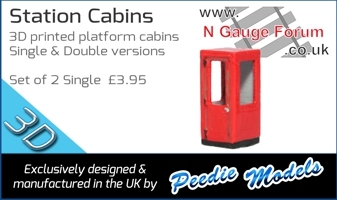 Sadly the local hobby shop is becoming a thing of the past over here, we save at least 50% to 70% by buying our train stuff from Hattons in the UK or Trainworld in the USA. One example is Peco Points from Hattons @ $13au including postage, to buy in a shop here we are looking at $28au. Problem, wages, superannuation for staff, overheads and rents on shops way to expensive and the cost of living in Oz is increasing all the time, we really don't have much choice but to buy overseas if we want to continue with our hobby. As some of you know, my laptop died just over a week ago. This had all of the files on it from the last 3 months (that I hadn't backed up), and designs I'd made for the forum. It was a Hard Drive error, and I suspect everything is lost. Even some photo's. I've been working today trying to install my software for my graphics on my old but faithful PC, so I can redesign the images that are lost - mainly the shirt graphics. Page created in 0.31 seconds with 45 queries.